Facebook Review Instructions – Thank you for your honesty. Search “eAssist Dental Solutions” and open our Facebook Business Page. Scroll Down and locate “Reviews” on the right hand side of the page. 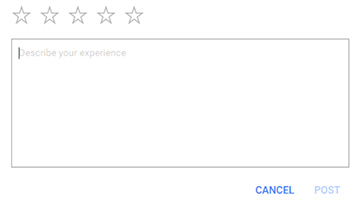 Click the gray stars to choose a rating and write an optional review. Click “public” to select your audience and click “done”. Google+ Review Instructions – Thank you for your honesty. You must have a Google Account and be logged into it. 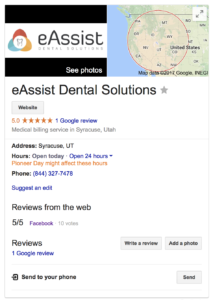 Search “eAssist Dental Solutions” on Google Search. Locate our listing on the left side of the page and click “write a review”. Click the stars to select a rating and write a review in the box below. Then select “Post”.